Nike Basketball will be bringing back the classic Nike LeBron “Freegums” design with a pair of Nike LeBron Soldier 9 “Freegums” colorways. The first pair to release was the Nike LeBron 9, and now Nike will be revisiting the classic design with another collaborative release. Seen here is a look at two Nike Soldier 9 colorways that don the Freegums graphics covering each entire upper. One pair features a White, Black and Game Blue color scheme, while the other sports Game Blue, White, and Crimson. 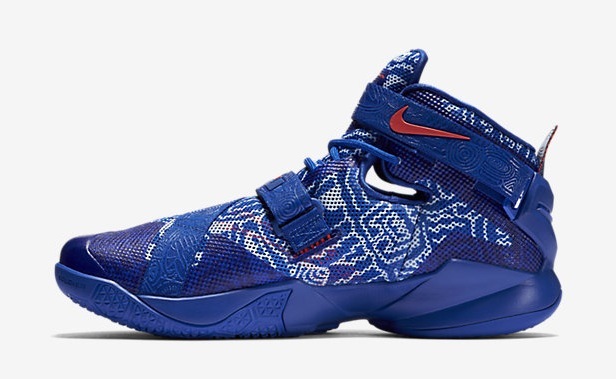 As of right now there is no set release date just yet, but we do give you a first look below at these Freegums Nike LeBron Soldier 9 colorways. Stay tuned to Sneaker Bar for further updates. UPDATE: Nike has just released both “Freegums” LeBron Soldier 9 dressed in either White/Black-Game Royal, or Game Royal/Bright Crimson-White. Both pairs can be purchased directly on Nike.com. The retail price tag is set at $140 USD.